The left-wing tilt of college campuses doesn’t take a break for the summer. This was made painfully clear this week in my State of Kansas. But no, it’s entirely intentional. It’s a “work of art” that the museum was displaying. The “artist” is Josephine Meckseper. Oh, and there’s also a black and white sock stuck to the flag, which she says symbolizes the detention of children at the border. Got it. She dislikes President Trump, she’s a global warming fanatic, and she doesn’t like the enforcement of our immigration laws. But does she really need to desecrate the American flag to make her point? What is it about the radical Left and the American flag? If an unpatriotic football player refuses to stand for the national anthem, they cheer him on. When Independence Day rolls around, there’s no flag on their homes. But when it comes to defacing the flag, they’re all in. 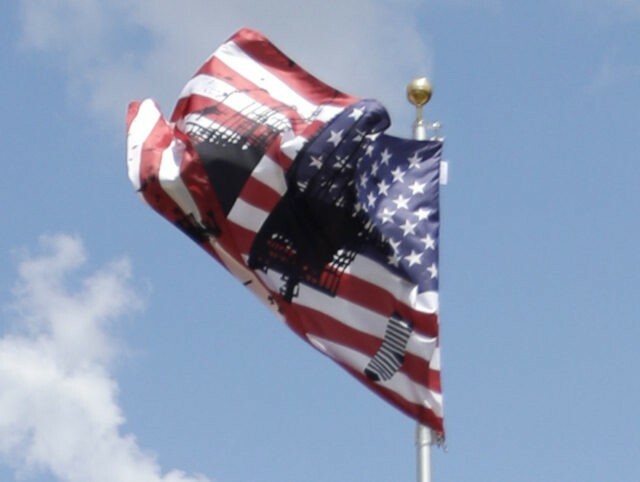 The flag at Kansas University is the unabashed desecration of the flag, posing as “art.” But just because someone calls it art, that doesn’t make it acceptable. It’s true that under the Supreme Court’s 5-4 decision interpreting the First Amendment in Texas v. Johnson, Meckseper can’t be prosecuted for desecrating the American flag. So the government cannot stop her from defacing the flag in her studio. But a public university funded by taxpayer dollars has no obligation whatsoever to fly her defaced flag. That’s why I immediately called on the University of Kansas to take down the flag. Patriotic Kansans and Jayhawks were outraged. But it shouldn’t take a demand from public officials to stop this display of a desecrated flag. Word broke Wednesday afternoon that the university, bowing to growing political pressure, would move the flag from its spot on the pole to a public exhibit inside the museum. But it will remain on display. And they wonder why Americans are so upset about the leftist bias at our college campuses. Kris W. Kobach is the elected Secretary of State of Kansas. An expert in immigration law and policy, he coauthored the Arizona SB-1070 immigration law and represented in federal court the ten ICE agents who sued to stop Obama’s 2012 DACA executive amnesty. He is currently a candidate for governor in Kansas. His website is kriskobach.com.